As a practical matter, deciding whether or not to file an Apache Junction bankruptcy is always a very difficult decision. No one sets out to be in a position where they are no longer able to pay their credit cards and meet their other monthly obligations. And, there are other options available. Declaring bankruptcy in Apache Junction, Arizona is often the best solution for people drowning in debt and struggling to pay their bills every month. Our Apache junction bankruptcy attorneys and Queen Creek bankruptcy lawyers handle all legal matters related to consumer bankruptcy filings, including protection under Chapter 7 and Chapter 13 of the bankruptcy code. We have filed hundreds of bankruptcies for people in Apache Junction, Queen Creek, and throughout Arizona. Our experienced bankruptcy attorneys and staff have found out that with the majority of our bankruptcy clients, the current financial problems that they are facing are often not their fault. In fact, they are frequently the result of events that are outside of their control. We understand how things can and do spiral out of control financially, especially when a you are hit with an expected event such as a loss of employment, unexpected medical bills, divorce, or death of a loved one. Apache Junction, Arizona, located about 40 miles East of Downtown Phoenix, AJ is nestled between the Superstition Mountains on the East and the City of Mesa to the West, Apache Junction is home to approximately 35,840 people. Apache Junction is located in both Maricopa and Pinal counties with the majority of its residents living in Pinal County. 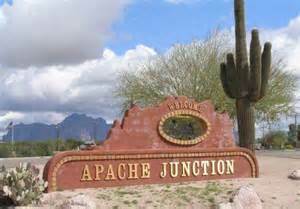 Named for the junction of US Hwy 60 and the Apache Trail, Apache Junction, Arizona was incorporated in 1978. According to the United States Census Bureau, the city has an area of 34.2 square miles (89 km2), all land. Steeped in history, legends, and lore, Apache Junction is home to a variety of attractions and events. Some of the more interesting include: The Superstition Mountain Museum, Gold Ghost Town, Lost Dutchman State Park, The Dolly Steamboat, and the Arizona Renaissance Festival. Contact Our Apache Junction and Queen Creek Bankruptcy Lawyers Now!